Michail is currently undertaking a PhD at the prestigious Eastman Institute in London, in the department of Periodontology. 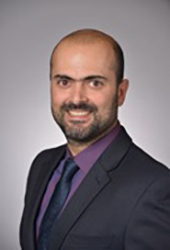 Michail brings with him 16 years of dental experience and extensive knowledge in his chosen field; often involved in poster presentations at the Academy of Osseointergration and attendance at lectures and seminars with leading experts in the field of periodontology. Michail’s passion for his area of special interest and caring and conscientious manner means he is well loved and appreciated by both patients and staff alike.